A magnolia tree in Berkeley. All photos: Ruth Gebreyesus. I moved to Berkeley in 2011 prepared to walk. Having spent my high school years in sleepier towns nearby, I often ventured to Berkeley on weekends to wander around the city on foot. In those days, I spent hours walking on Telegraph Avenue, where I felt virtually unseen in the stream of pedestrians, street performers, and vendors, making stops to eat cheap slices of pizza and buy used CDs. The year I moved, I arrived carless, bikeless, and curious. I was initially partial to University Avenue, a thoroughfare that bisects the city east to west, reading its activity as a sign of safety. But I quickly found that I preferred the offerings of quieter tributaries. Strolling through side streets, it didn’t take me long to realize that Berkeley residents like to interact with neighbors and passersby alike, often indirectly. They — and now I — routinely put boxes labeled “FREE” and containing colanders, pans, and other household items in front yards and adjacent sidewalks. They maintain small birdhouse-shaped libraries, ubiquitous throughout residential neighborhoods and operating on an ambitious honor system of returning or replacing books taken. A right turn and seven short minutes from my apartment, there’s a house whose fence displays laminated printouts of poetry. “Am I a poet or a poem?” asks a flyer; beside it are haiku and other poesies. But the gratis offerings that have engaged me the most have been flowers. My first spring, I met freesias. If I had seen them before, I’d forgotten or never noted their names. On this day, I saw them growing in a small strip of soil between a fence and the sidewalk on my walk to the laundromat. They jutted up, bright red and yellow flowers in rows descending down the stem. The beauty of freesias is noteworthy, but their scent is divine. They smell like the perfect flower — a mulled sweetness, freed of artifice by a hint of clean and wet soil. Every year since that spring, those freesias greet me through late summer and I happily get on my knees, bending towards their flimsy home in that sliver of soil to fully delight in their scent. A couple of blocks from the freesias lives a saucer magnolia tree whose blooms are profoundly immodest. 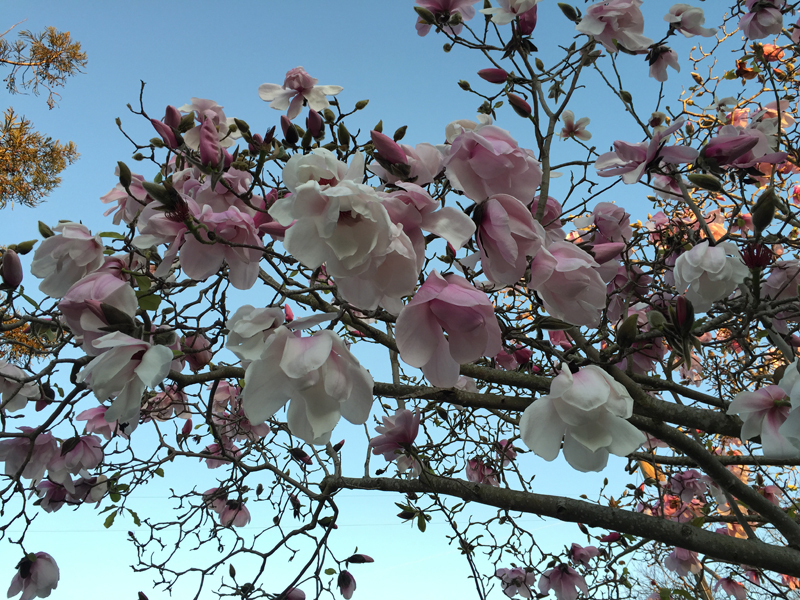 Blossoming in winter, it counts down to spring with each drop of its large, blushing petals, which form a dramatic circumference around its smooth gray trunk. Not far from that magnolia tree lives a young Black family. Though they are strangers to me, they bring me comfort and joy each time we pass each other on the street. We smile and we nod, and I wonder if they also move with the knowledge that we are few and fewer by the day in this city. That the magnificent trees and flowers that surround us might very well outlast us in Berkeley. There are no flowers on University Avenue. At least none that I’ve noticed. Instead, I’ve found compliments hurled like accusations by strange men. There have been even stranger men who follow me for enough blocks to give me time to wonder about their families, their apparent free time, and the catalyst for their sudden focus on me. A warm Saturday afternoon a few summers back, I was on University waiting at a crosswalk when an older white man approached and walked a full circle around me. Gripping a canvas tote full of books and papers, he asked me “How much?” with a grin. Stunned and silent, I felt like I couldn’t move, like I’d always been stuck on that sidewalk, and that men like him had always asked this same question. Seeking pleasure in the blooms of Berkeley’s side streets, I run the risk of trespassing. I think of this especially when I reflexively reach to pop the seeds of impatiens I encounter. Always flowering, and always having been a part of my life, impatiens stand out to me the way a sibling’s name pierces through vague chatter. 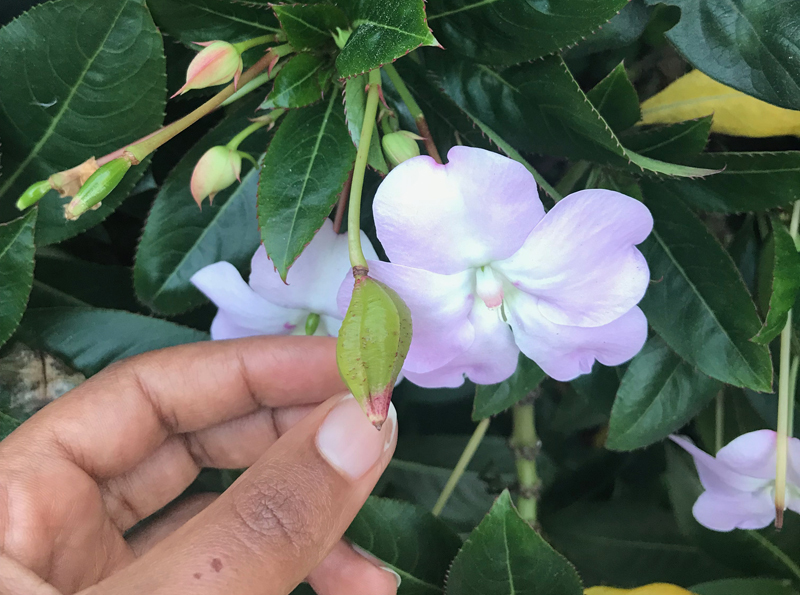 Typically growing wider than taller, impatiens are dense with gently serrated leaves and uniformly dotted with silky flowers, often a soft pink or a lipstick red. These blooms, though persistent, aren’t particularly remarkable — the real fun lies with their seedpods. Green spheroids with seams running their length, the pods balloon when mature, gravid with impatient seeds. As long as I’ve known impatiens, I’ve known the pleasure of lightly pressing these pods, expelling the seeds into the air and leaving behind the caterpillar-like rolls that form when the pods retract. 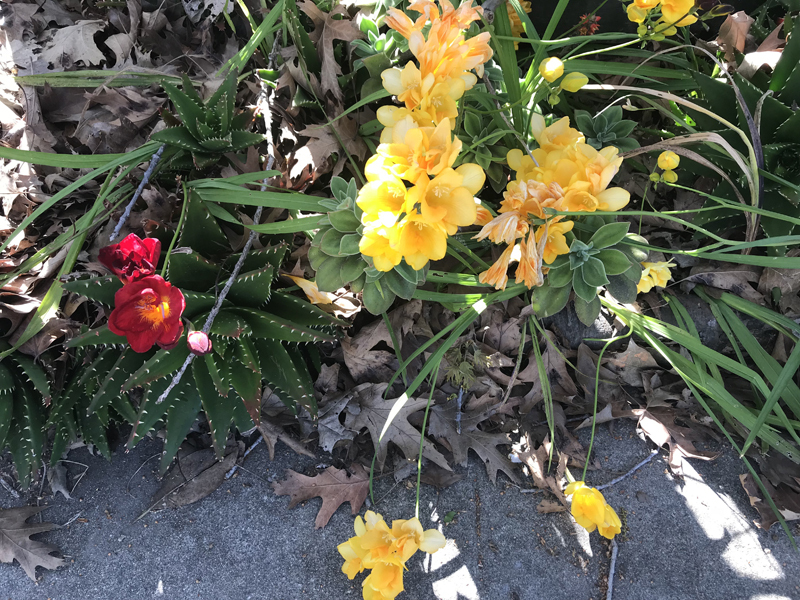 When I recently came across a generous impatiens for this game two blocks west of my apartment that didn’t demand I leave the sidewalk to play, I was overcome with a sense of relief. Flowers themselves are full of danger. 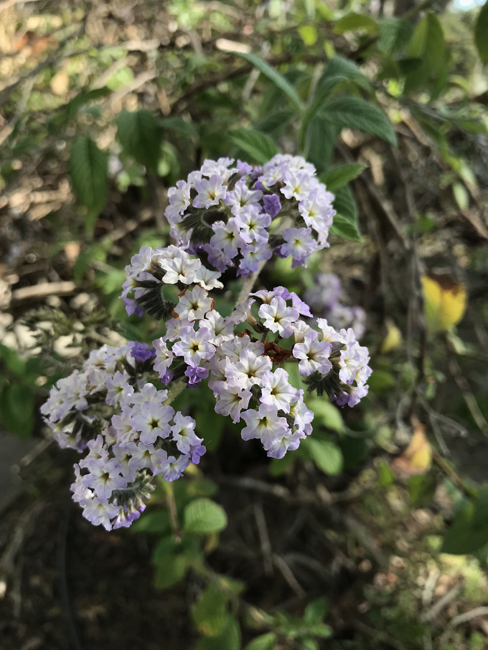 There’s a heliotrope bush whose blooms I have to smell with my eyes closed because its scent pulls my face towards the delicious flower and the errant twigs it lives among. Surely you understand if you’ve ever smelled a heliotrope bloom. If you haven’t, imagine the most sophisticated talcum powder — powdery, of course, but also like almonds en masse, crushed with sweet fruit. A peach, maybe. 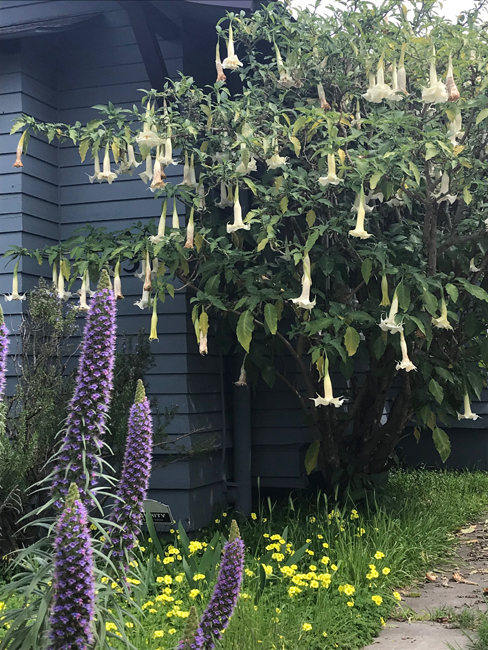 There’s also the brugmansia trees that stand bashfully in many Berkeley yards. My friend Benny recently told me that you shouldn’t sleep near a blooming brugmansia unless you want nightmares. Odd that a tree whose blooms hang upside-down like bells on branches, emitting their brightest scent at night, wouldn’t be the perfect place to lie flat on your back and dream.